Diabetic Ketoacidosis and hyperosmolar hyperglycemic state are two acute serious metabolic complications of diabetes mellitus. Hypoglycaemia is another common problem encountered in diabetics. Ketoacidosis: A condition resulting from deficient insulin availability, leading to lipid oxidation and metabolism rather than glucose metabolism. The insulin absence results in free fatty acid (FFA) released from adipose tissue and in unregulated hepatic FFA oxidation and ketogenesis. Type I Diabetes: Autoimmune disease where there is attack of beta cells of the pancreas leading to insulin deficiency and a requirement for exogenous insulin to prevent ketoacidosis. Type II Diabetes: It usually consists of tissue-level insulin resistance (although exogenous insulin is often required) and rarely leads to ketoacidosis. Kussmaul breathing: Deep, rapid respirations associated with acidosis. Overview Diabetic Ketoacidosis may be the presenting feature in a patient not previously recognised as having diabetes. In a patient with known diabetes, it may be precipitated by omitting insulin doses, or by the insulin. Diabetic ketoacidosis has a mortality rate of 8- to 50% in the elderly. Side Note Kussmaul breathing is air hunger, rapid deep breathing a sign of metabolic acidosis. This is different to Kusmaul’s sign looks at JVP relationship with breathing. Think Check ABG, EUC and glucose every 4hours. Monitor ECG for hypokalaemia/hyperkalaemia. Monitor IV fluid, insulin, glucose and K+ should all be run in separate lines. Management The main aim in treating DKA is to progressively improve blood pH and clear the body of excessive ketones by aggressive fluid replacement and insulin therapy. Check ABG, EUC every 4hours. 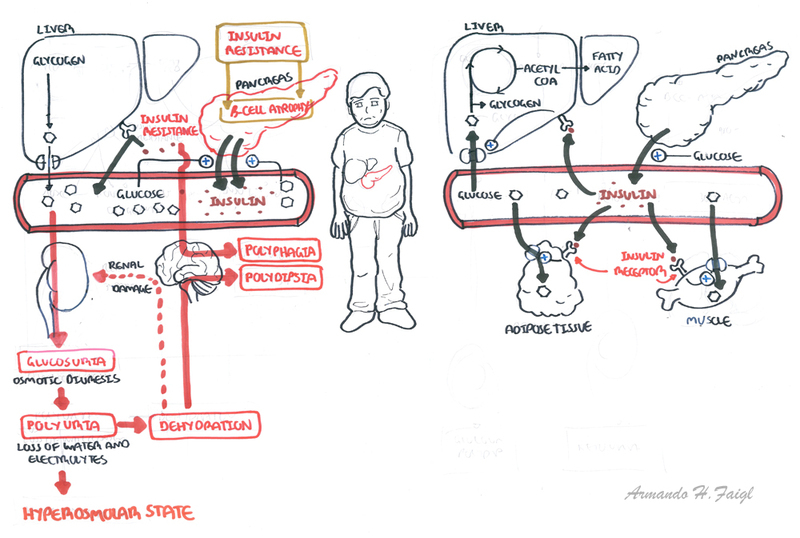 Hyperosmolar Hyperglyaecmic State is a complication of type 2 diabetes. It involves extremely high blood sugar (glucose) levels without the presence of ketones. Type I Diabetes: Is caused by a severe endogenous insulin deficiency and a requirement for exogenous insulin to prevent ketoacidosis. Type II Diabetes: It usually consists of tissue-level insulin resistance (although exogenous insulin is often required) and can lead to HHS, rarely leads to ketoacidosis. 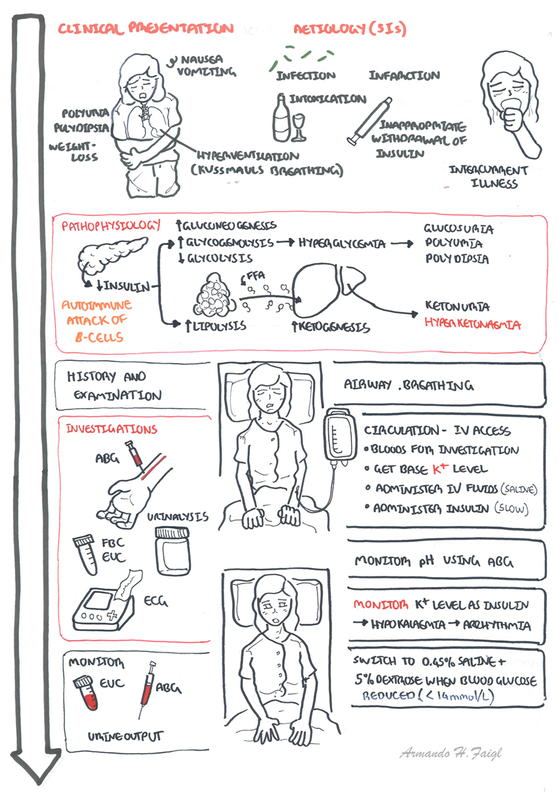 Overview Hyperosmolar Hyperglycaemia (HOH) state occurring primarily in type 2 diabetes and is characterised by marked hyperglycaemia and dehydration without ketoacidosis. The disturbance in consciousness in patients varies from drowsy to comatose. HOH is a more sinister complication than ketoacidosis with a mortality rate as high as 50%. No ketonuria + on urine dip testing can occur with starvation and vomiting. Pathophysiology This condition results from a combination of insulin deficiency and coun- terregulatory hormone excess. The insulin present stops ketone produc- tion but in insufficient quantities to prevent worsening hyperglycemia. Management Same as DKA, but with a few exception because patients are usually older. Potassium – Administration of Insulin can cause hypokalemia, potassium levels should be checked.